Driving a station wagon never made you look so good. This is clearly not the station wagon many of us grew up with. No, the 2013 Audi RS4 Avant is for the true enthusiast who may need some extra space in the back. And no, don&apos;t think that extra space is necessarily for the family, it could also be utilized for a weekend&apos;s worth of gear for an outdoor excursion. Or simply you&apos;ll just look awesome blasting down the street in a station wagon. Wait, no, an Avant. That&apos;s Audi-speak for their fabulous line of wagons. 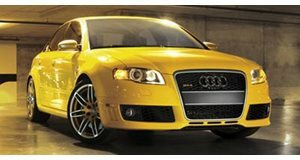 The 2013 RS4 Avant, revealed earlier this year, is powered by a naturally-aspirated 4.2-liter V8 that produces 450 wonderful horsepower and 317.15lb-ft of torque. This translates into some solid performance numbers. It can sprint from 0 to 62 mph in just 4.7 seconds and has a top speed of 155 mph. The sole transmission is a seven-speed S tronic dual-clutch that delivers power to the Quattro all-wheel drive system. Fuel economy is also quite respectable considering the car&apos;s overall power and performance, coming in at 21.98 mpg on the U.S. cycle, which is actually 26 percent less than the previous model. For those who truly want to get the most out of it, RS4 Avant comes with launch control, allowing for the driver to simply hit the accelerator while the system manages the engagement of the clutch so that all of the engine&apos;s power is delivered to the road via the Quattro system. Audi also points out that the car is largely made from aluminum and the body is lowered by some 20 mm compared to the standard A4 Avant. 19-inch forged alloy wheels are standard while 20-inchers are optional. In addition, there&apos;s a new electromechanical power steering system that gives the driver even better feedback than the last version. The interior is done entirely in black with standard carbon inlays and either aluminum, piano finish, or stainless steel mesh available as options. There&apos;s also a leather-covered flat-bottom steering wheel and special sports seats. Along with an optional MMI navigation plus system, Bluetooth and a Bang & Olufsen sound system, there&apos;s also between 17.30 and 50.50 cubic feet of storage space (depending on backseat position). Set to arrive in dealerships this fall, Audi claims German pricing will start at €76,000. As of now, there are no plans to bring it to the U.S., but that could possibly change if potential buyers push Audi hard enough.